Now I really want a waffle. My university was really lacking in the Waffletorium department. Now I want waffles too. And I don’t even own a toaster. Sigh. Nightshade is still the most awesome. Just his expressions are enough to crack me up. You need to make the map bigger (and/or a PDF) so that I can print one! 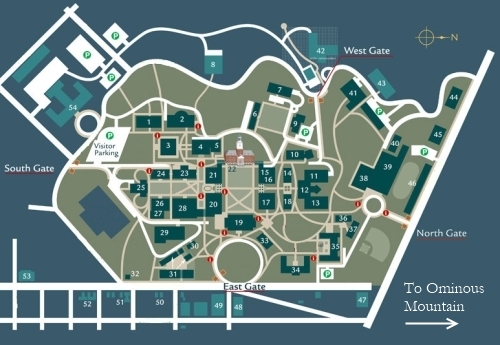 Not to give it away, but that is a map of a real university. If you can figure out which one, you can find the PDF. Is Meredith breaking the fourth wall in the last panel? But it seems she is glancing at Nightshade, who is glancing at her, when she says “Well, I *do*” as if defending ‘being out of character’. It wouldn’t make sense if she was talking to Britnee then, and she isn’t raising her voice (as indicated by lack of exclamation marks) which she apparently needs for Britnee to hear her, judging from text earlier in her speech bubble and previous panels. The only other person around is Nightshade. Does she know Nightshade can move and talk? I think you are overanalyzing a teensy bit. She is responding to the “What” with the blueberries thing, then making an aside to Nightshade, who is visibly incredulous. Two bubbles, two statements. There are two #28s! Does it mean the Mixology Dept is actually in a residence hall? Wicked! that map looks familiar. LOL. and erm, can the TBA residence hall be named after me? I totally do not mind behind the grandmaster of mixology. Nightshade’s expressions in the top left and bottom right! Soooo cute!